Smartphone GPS navigation has quickly grown into a robust product category with lots of options for consumers. Should you use a smartphone navigation app, or go for a dedicated GPS device from a leading manufacturer, such as Garmin or TomTom? Here, we list the pros and cons for each technology and provide you with decision-making guidance. Smartphones such as the iPhone, or various Android operating-system-powered models have sharp, clear displays with capacitive touchscreens. They are ideal for palm-of-the-hand operation. However, their small fonts and menu systems are difficult to use at arm's length, as when mounted on a windshield or dash mount. It can be difficult to see and operate smartphone GPS while driving. Most GPS turn-by-turn navigation programs for smartphones are somewhat adapted to this type of use with larger fonts and buttons, but these are still smaller than those found on a typical dedicated GPS device. Dedicated GPS personal navigation devices (PND) have resistive touchscreens that are larger overall, typically 4.3 inches or 5.5 inches diagonally, compared to 4.0 inches for a typical smartphone. And larger screen (5-plus inches) PNDs are becoming more common. In addition, PND menu systems, touchscreen keyboards, display letters, and numerals, have been optimized for arms-length viewing and have been tuned for usability while driving. Also, PND displays have room to include more information about the distance to upcoming turns, upcoming street names, speed limit information, time-of-arrival information and more. While elegance and a light touch make smartphones' capacitive touchscreens a pleasure to use, smartphone screens are at best a compromise for in-car navigation. However, new larger-size smartphone screens make them practical for windshield-mounted navigation. The simplicity, durability, and larger size of the dedicated GPS PND resistive touchscreen wins out in this comparison, and this is one of the biggest factors to consider in the smartphone vs. PND comparison. Many use their smartphone's turn-by-turn navigation while the phone rests on the passenger seat or some other flat area (or they simply listen to the directions), but there is no doubt that a windshield or dash mount provides optimal viewing for turn-by-turn in-car directions. Smartphone windshield mounts range from simple, one-size-fits-all holders that have no charger ports or any additional features, to sophisticated units such as the TomTom Car Kit, which includes a charger, speaker, supplemental GPS chip, microphone, and more. A smartphone windshield mount may be costly, so factor that into your decision, and make sure the mount includes a charger, or that you have an accessory power port charger for your smartphone. Dedicated PNDs, by contrast, all come with windshield mounts and power port chargers included. Mounts from the major manufacturers are well-built, very adjustable, and adaptable to various mounting points with the use of an included sticky-backed disk. While there are nice smartphone windshield mounts on the market, getting one takes some time, effort, and money on your part. By contrast, mounts are no-brainers and come in the box with PNDs, so PNDs have the edge in mounting, also. Smartphone map and points-of-interest databases are either downloaded initially with the purchase of the app, per TomTom for iPhone or are downloaded on the fly, per MotionX GPS Drive. When you download maps on the fly, you'll always have the latest version. The downside is that you may be without maps in remote areas out of cell phone tower range. If you do a lot of rural driving out of 3G range, stay with onboard maps. Smartphone turn-by-turn apps generally use the same high-quality maps and databases provided by mapping giants TeleNav and NavTeq, as do the PND manufacturers. Google has gone its own way with Google Maps Navigation. We've generally had good experiences and accurate directions from name-brand smartphone turn-by-turn apps such as those offered by TomTom and Garmin. PNDs keep map sets on board, and these should be updated (most makers now offer free map updates) each year. Smartphones have the big advantage of always being connected to the cellular network and the internet. 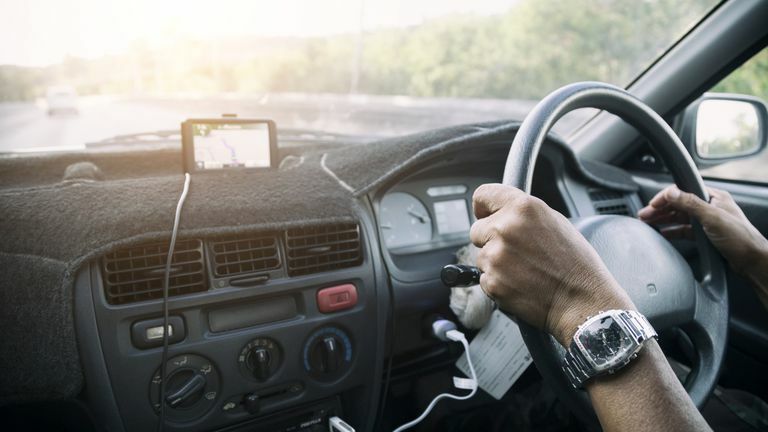 Some smartphone GPS navigation apps take advantage of this connectivity with sophisticated search, real-time traffic detection and avoidance, and services such as gas prices, while others make scant use of the internet. Check out what the app does with connectivity before you buy. Dedicated PNDs may or may not include cellular network/internet connectivity. Check the specifications, and note that you'll need to pay a monthly fee to maintain connectivity in a PND. Smartphones generally have excellent web browsers, while PNDs have minimal-function browsers or no browsers. Smartphones have the edge in the use of connectivity. There's a lot to consider in the smartphone navigation vs. PND debate, but these facts should help you decide.